The government has published a hybrid bill to pave the way for the high-speed rail line between London and Birmingham. The bill, effectively the planning application for the scheme, allows those affected by the proposed line to petition Parliament both for and against the proposals and have their case heard by a committee of MPs. An Environmental Statement for Phase One of the scheme has also been published. The bill and supporting material stretches to nearly 50,000 pages. The Department for Transport has said that the bill should achieve Royal Assent by the end of the current Parliament in 2015, allowing construction of Phase One to begin in 2016 or 2017. This initial London to Birmingham section of the route is currently scheduled for completion in 2026. The government is seeking comments on all the documents forming the environmental statement through the HS2 Phase One environmental statement consultation open between 25 November 2013 and 24 January 2014. See following pages for relevant extracts from the Environmental Statement and other documents dealing with the section of the line nearest to Sulgrave. Click here for a government document entitled “Understanding the Environmental Statement”. At Calvert the route will cross under the former Bicester to Bletchley railway (part of the proposed East-West Rail Line) where the infrastructure maintenance depot will be located. It will continue to broadly follow the corridor of the former Great Central Main Line railway, largely in cutting, before passing to the east of Brackley.The route will then head north-west through open countryside, largely in cutting, but with an approximately 2.1km (1.3miles) long tunnel past Greatworth. It will then enter Chipping Warden tunnel, an approximately 2.5km (1.6miles) long tunnel past Chipping Warden and Aston le Walls, before running largely on the surface towards Ladbroke and Southam. Beyond Southam the route will pass beneath Long Itchington Wood and Ufton Wood in an approximately 1.9km (1.2mile) long tunnel. Tunnels will be constructed at a number of locations along the route, using two methods of construction. Long or deep tunnels will be created using a tunnel boring machine. With the exception of the HS1 – HS2 Link tunnel, which is a single bore and single track tunnel, all other bored tunnels will be twin bore, comprising two parallel tunnels each containing a single rail track. Short tunnels will be constructed using a cut-and-cover method, which involves excavating downwards, building a structural box and then restoring the land over the top. The railway alignment has been designed to allow for train speeds of up to 400kph (250mph). The track will either be ballasted track, whereby the rails will be fastened to concrete sleepers supported by ballast (a form of crushed rock), or slab track, whereby the rails will be supported on a continuous concrete structure. Road, public right of way, utility and watercourse diversions Where road diversions are required, the nature of and programme for the works will be undertaken in consultation with the relevant highway authority. Where roads, public rights of way and utilities need to be diverted or realigned, they will normally follow the shortest practicable route, taking into account safety, pedestrian and traffic flows, construction duration and local environmental effects. Where watercourses require diversion, channel flow will be designed and maintained in consultation with the relevant regulatory authority. To avoid or reduce significant noise effects, the project incorporates noise barriers, generally in the form of landscape earthworks i.e. cuttings and embankments, noise fence barriers or ‘low-level’ barriers on viaducts. Construction and commissioning of the Phase One project is expected to take place between 2017 and the end of 2026. The duration, intensity and scale of works along the route will vary over this period. There will be two types of construction compound along the route: main construction compounds and satellite construction compounds.Thirty-one main construction compounds will be required. Main construction compounds will act as strategic hubs for core project staff, such as engineering, planning and construction delivery staff. They will include areas for the storage of construction equipment and materials, maintenance and parking facilities, together with the main welfare facilities for staff. Overnight accommodation for construction staff will be provided at some compounds. The draft CoCP outlines the proposed working hours for construction. Core working hours will be from 08:00-18:00 on weekdays (excluding bank holidays) and from 08:00-13:00 on Saturdays. There will be two types of trains: trains that will run only on the high speed network (known as ‘captive’ trains) and trains which will be able to run on both the high speed network and the existing network (known as ‘classic compatible’ trains). Services will operate between 05:00-24:00 from Monday to Saturday and between 08:00-24:00 on Sunday. Maintenance and engineering works will normally take place outside these operational hours, unless the works can be fully separated to enable them to be undertaken during the day with trains operating at the same time. The project will not require the demolition of any Grade I or Grade II* listed building. In designing the project, HS2 Ltd’s aim has been to avoid or reduce direct adverse impacts on heritage assets. For example, the design of the remodelled Euston station has been refined to avoid the demolition of the Grade II* listed Royal College of General Practitioners building on Melton Street. The route has been re-aligned to avoid the site of the scheduled Roman villa at Edgcote, to reduce the impact on Edgcote House and the main area of the registered battlefield. The project will affect Edgcote battlefield and one scheduled monument (Grim’s Ditch). Eighteen Grade II listed buildings will be directly affected: six will be demolished, four will be altered and eight will be removed and relocated. There will be modification to a boundary wall to the Grade I listed Hartwell House. Two Grade II* registered parks and gardens and 81 lengths of historic hedgerow will be directly affected. In rural areas, the construction of the project will result in the loss of barn owl territories. During operation, barn owls may also be struck by passing trains. HS2 Ltd will pursue opportunities with local landowners to provide owl nesting boxes to help increase barn owl populations away from the route. The route has been kept low in the landscape, where reasonably practicable. For example, at Greatworth, Chipping Warden and Aston le Walls the route will be in cutting and tunnel to avoid landscape and visual effects on these rural villages. Through the Chilterns AONB between Chalfont St. Giles and Wendover, a distance of over 20km, measures have been incorporated into the design of the project to limit landscape and visual effects. The route will pass through the AONB in tunnel for 12.1km and in cutting for 5.5km. This will avoid or greatly limit the visibility and noise of the railway in the rural landscape. Individual elements of the project, such as bridges and viaducts, will be designed to ensure that they are in keeping with the local landscape. Detailed design, materials and finishes will be subject to approval by the local planning authority under the provisions of the Bill.Trees and vegetation will be planted along the route to provide visual screening. For example, planting will take place to the south of Aylesbury, to reduce visual impacts and integrate the railway into the surrounding area. HS2 Ltd and its contractors will maintain and monitor these newly planted and landscaped areas. Two million trees will be planted to integrate the railway into the landscape. HS2 Ltd estimates that the project will create the equivalent of approximately 14,600 full time construction jobs. Depending on the skill levels required, these jobs will be available to local people along the route. HS2 Ltd expects to create 1,000 apprenticeships as part of the construction workforce for the project. HS2 Ltd estimates that a further 5,480 jobs will be created by the suppliers of goods and services to construct the project and through the money that construction staff will spend in the local area. HS2 Ltd has estimated that Phase One will support the generation of 30,000 jobs around the four stations. The HS2 Growth Task Force has been established to look at development opportunities around stations, wider regeneration opportunities, working with the supply chain for goods and services and seeking ways to increase skills and apprenticeship opportunities. The assessment of sound, noise and vibration considers the likely significant noise and vibration effects arising from operation of the project, assuming full operation of the Y network. The assessment considers effects on occupiers of residential properties and changes in the noise environment of local communities along the route. The assessment also considers the effects of noise on community facilities such as schools, hospitals, places of worship, and also commercial properties such as offices and hotels.Sixty-seven dwellings are assessed to be significantly affected by noise from the operation of the railway. For dwellings which satisfy the applicable qualifying criteria, HS2 Ltd will offer noise insulation. If noise insulation is accepted by the owner, this will help to reduce or avoid these effects. Operation of the railway has been assessed as likely to result in increases in external noise that are considered significant around a limited number of residential areas and non-residential buildings. These effects occur mainly within 300m of the route. Taking account of modern high speed trains and resilient track designs, the project will not give rise to significant ground-borne noise or vibration effects on those living close to the railway. The draft CoCP includes mitigation measures to reduce and manage traffic and transport impacts during construction of the project. Construction of the project will lead to increased vehicular traffic and so cause increased congestion and journey times at a number of locations along the route. In order to keep disruption and congestion resulting from construction traffic to a reasonable minimum, HS2 Ltd will put in place measures to limit the number of construction vehicles using the public road network, especially local roads. A series of travel plans will be implemented to help mitigate the transport related effects during construction (such as through the management of construction staff movements). It will be necessary to close, realign or divert certain local roads and public rights of way along the Phase One route, both during construction and in a limited number of cases, permanently. In all such cases, alternative routes will be available. Where a new bridge across the route is required, it will ordinarily be constructed offline so as to enable the existing bridge to continue in use until its replacement is ready to bring into public use. During the construction and operation of the project, HS2 Ltd’s objective is to limit the generation of waste, and to reuse, recycle and recover waste generated by the project, with disposal to landfill only as a last resort. Construction of the project will result in the generation of approximately 128 million tonnes of excavated material, over 90% will be re-used in the construction of engineering embankments and environmental mitigation earthworks included in the design. Construction of the project will require almost 5 million tonnes of waste to be disposed of to landfill. Over 90% of this residual waste will come from excavation, the remaining 10% being waste from demolition, construction and worker accommodation sites. Prior to implementation, HS2 Ltd will investigate further measures to limit surplus construction waste and the quantity of residual project waste to landfill. Opportunities may also arise at the time of construction to supply surplus excavated material for use in local construction projects Where the transportation of that material would result in significant adverse environmental effects, sustainable placement will be used. Sustainable placement is the on-site placement of surplus excavated material to avoid causing environmental effects (e.g. transport) that would otherwise be associated with the off-site disposal of that material. Sites for sustainable placement have been selected on the basis of their suitability for the on-site placement of surplus excavated material. HS2 Ltd estimates that, during the first year of operation in 2026, the project will generate approximately 18,000 tonnes of waste, principally from the four railway stations, passenger trains, track maintenance and depots. 77% of this waste will be reused, recycled or recovered. 23% (4,150 tonnes) will be disposed of to landfill as non-hazardous waste. The Greatworth to Lower Boddington area is mostly rural in character, with agriculture being the main land use. Settlements include the villages of Greatworth and Chipping Warden, Thorpe Mandeville, Sulgrave, Culworth, Aston le Walls, Upper Boddington and Lower Boddington. Transport routes include the M1, the M40 and the A361. From south-east of Halse Copse South, the route will proceed north in a series of cuttings, embankments and viaducts, passing to the east of the settlements of Greatworth, Thorpe Mandeville, Edgcote and Chipping Warden, and to the south-west of Aston le Walls (see Figure 28). Running northwards, it will pass to the north-west of Lower Boddington before reaching the edge of the area at the Northamptonshire and Warwickshire county boundary, west of Fox Covert. Three viaducts will cross Lower Thorpe, the River Cherwell and Highfurlong Brook. Tunnels will be located at Greatworth and at Chipping Warden. Auto-transformer stations will be adjacent to the southern entrance of the Greatworth tunnel, east of Wardington Road at Edgcote and adjacent to the tunnel entrance at Chipping Warden. The project will require the demolition of four dwellings. A main construction site compound will be located east of Chipping Warden. Six satellite compounds will be located in the area. Five roads will be permanently diverted and one permanently closed.. Planting and habitat creation have been included within the project including for example, an area of lowland mixed deciduous woodland and lowland meadow grassland to connect Halse Copse South Local Wildlife Site with Halse Copse North Local Wildlife Site. Construction and operation of the project in this area are not likely to result in any adverse residual effects on air quality or land quality. Similarly, no likely adverse residual effects have been identified as arising during operation for agriculture, forestry and soils, socio-economics or water resources and flood risk assessment. Construction of the project will result in land take from 28 agricultural holdings. Of these, five (Lower Thorpe Farm, Twin Oaks, Fir Tree Nursery, Spella Field and The Bungalow) are likely to cease to operate. Approximately 193ha agricultural land will be permanently lost including 29ha of high quality land. Glyn Davies Wood nature reserve will be inaccessible during construction. Two properties in the small hamlet of Lower Thorpe will be lost. Land will be permanently required for the project at Culworth Grounds Farm and Washbrook Farm, which operate as equestrian centres. Some residential properties on Banbury Lane as well as users of Church of St John the Baptist, the village hall and The Three Conies public house in Thorpe Mandeville will experience temporary adverse effects on amenity as a result of construction vehicles and noise effects. There will also be temporary adverse amenity effects for some residential properties and Chipping Warden Primary School on the A361 Byfield Road and some residential properties and The Carpenters Arms on Banbury Road in Lower Boddington, in each case due to temporarily increased traffic associated with construction, visual and noise effects. Up to 10 residential properties around Banbury Lane, in the north of Thorpe Mandeville and in Lower Thorpe will be affected permanently by the views of and noise from the operation of the project. The Grade II listed Lower Thorpe Farmhouse, the non-designated Stone House and a former wireless station within Greatworth Park will be lost. Archaeological assets will be permanently lost including prehistoric cropmark sites, Romano-British settlement remains (notably near Edgcote) and remains that may be associated with the Battle of Edgcote. Twenty-nine lengths of historic hedgerow and part of the ancient woodland of Halse Copse South will be permanently removed. Elements of ridge and furrow that contribute to the setting of historic settlements and buildings such as Greatworth Hall and Thorpe Mandeville will be removed. The setting of Edgcote House and associated parkland, the landscape of the Battle of Edgcote, Edgcote, Greatworth, Thorpe Mandeville and Lower Thorpe will be affected visually and by noise during operation of the project. Approximately 0.3ha of ancient woodland from Halse Copse South Local Wildlife Site will be lost. There will be an increase in the extent of semi-natural broadleaved woodland between Halse Copse South and Halse Copse North. The presence of construction works and changes to the existing landform and vegetation patterns will significantly affect the character and appearance of the local landscape. During operation, the effect of the project on the character and appearance of the local landscape will substantially reduce over time as mitigation planting grows and matures. Significant effects will remain in some parts of the local landscape due to the presence of engineered landforms, infrastructure and overhead line equipment. The presence of construction works will cause temporary effects on views within the area, including those at Halse Copse Farm, Hill Farm Culworth Grounds Farm, dwellings on the western and southern edge of Culworth, dwellings on the western edges of Aston le Walls and dwellings on the south-western edge of Lower Boddington. Views from Greatworth Park, Washbrook Farm Eventing Centre and a number of public rights of way and roads will also be affected. During operation, Lower Thorpe and Edgcote viaducts and the Banbury Road bridge will continue to affect views in the local area. The visual effects of the project will reduce over time as planting matures. The project will require the demolition of industrial premises at Greatworth Park trading estate. As a result, two motorsport engineering businesses will need to relocate. Construction works and construction traffic associated with the Claydon Road bridge may discourage people from using The Carpenters Arms public house for up to three years. It is estimated that the project will result in the displacement or possible loss of a total of 40 jobs within this area. Taking into account total employment within the area, the impact on the local economy from the displacement or possible loss of jobs is considered to be relatively modest compared to the scale of economic activity and opportunity in the area. Measures in the draft CoCP will be implemented to manage noise and vibration during construction, including the use of quiet and low-vibration equipment and screening along the edge of the construction worksites, where necessary. Tall screening will be used in a number of locations, including adjacent to the residential communities at Greatworth (including Greatworth Park), Thorpe Mandeville, Chipping Warden, Aston le Walls and Lower Boddington. Potential significant adverse effects from construction are reported for commercial properties at Greatworth Hall and Greatworth Park. Noise from construction traffic is likely to affect residential properties, the Church of St John the Baptist, Thorpe Mandeville village hall and The Three Conies public house along Banbury Lane, where it passes through Thorpe Mandeville. A number of mitigation measures have been included in the design of the project to mitigate noise effects during operation. Tunnels will avoid and reduce noise effects in and around Greatworth, Chipping Warden and Aston le Walls. The occupiers of six dwellings closest to the route have been assessed to be significantly affected by noise from the operation of the railway. For dwellings which satisfy the applicable qualifying criteria, HS2 Ltd will offer noise insulation. If noise insulation is accepted by the owner, this will help to reduce or avoid these effects. The dwellings at the following locations are likely to qualify: The Dairy, Granary Barn, The Threshing Barn and The Forge on Culworth Road near Chipping Warden and The Old Dairy and the dwelling at Greatworth Hall. Operation of the railway has been assessed as likely to result in increases in external noise that are considered significant around residential properties on the eastern edge of Thorpe Mandeville. Offices at Greatworth Hall and at Spella Barn in Lower Boddington are also likely to be affected. Increased traffic during the construction will lead to congestion and delay at junctions including at the A422 with A361 (M40 junction 11); A422 with the B4525 Banbury Lane; A361 Banbury Road with Welsh Road; A361 Badby Road West with B4037 Badby Road; and the A45 Stefen Way/A361 Badby Road West. Construction traffic in this area will affect pedestrians and cyclists using roads including Claydon Road (also known as Hill Road); elsRoad; Appletree Lane; the A361 Byfield Road; Banbury Lane; Marston Road, and Radstone Road. Temporary closure of Claydon Road; Appletree Lane; Wardington Road; Banbury Lane; and Helmdon Road during construction will cause some additional delay to vehicles due to the additional travel distance required by the associated diversions. The temporary closure of Appletree Lane, Helmdon Road and the permanent closure of Culworth Road will cause some additional delay for bus users, due to bus route diversions. Temporary closure and associated diversion of 12 public rights of way and nine roads during construction will affect pedestrians, cyclists and horse riders due to the increased travel distances eqd stopping up of Culworth Road will cause some additional delay for users of these roads due to the additional travel distance required by associated diversions. The stopping up of Culworth Road will also cause some additional delay for bus users, due to the diversion of bus routes. Permanent realignment of five public rights of way and two roads will affect pedestrians and cyclists due to increased travel distances. During construction, water that would otherwise flow into Painters Spinney and Old Barn Spinney would be drawn into the Greatworth tunnel, resulting in temporary adverse effects on the springs in these locations. The effect on groundwater levels and springs is expected to recover following completion of construction, with no significant permanent effect. Construction of the Thorpe Mandeville cutting will result in the permanent loss of a spring at Costow House and a reduction in groundwater flows and natural flow in watercourses near Costow House. This reduction in surface water flow and groundwater level could also permanently affect the water-dependent ecological habitats at Costow Fields. Volume 1 – Introduction and Background Information. 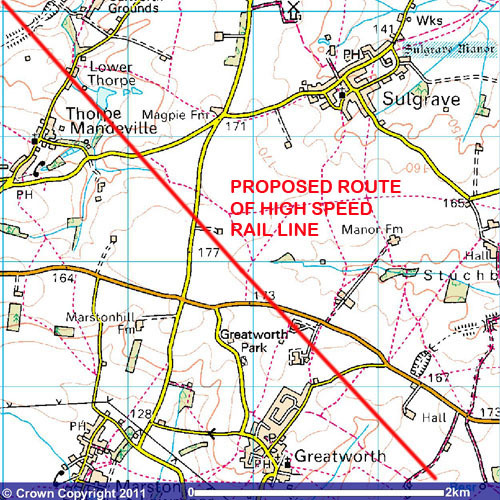 Volume 2 – Community Forum Areas – Greatworth to Lower Boddington. Volume 2 – Greatworth to Lower Boddington – Construction Drawings. This entry was posted on Friday, December 13th, 2013 at 1:16 pm	and is filed under News. You can follow any responses to this entry through the RSS 2.0 feed. You can leave a response, or trackback from your own site.